I was recently in Akron presenting a forthcoming paper of mine. One of the interesting things about the Northeast Ohio constellation of cities is that there’s a very weak sense of regional identity. In almost any other context, Cleveland and Akron would be considered some type of twin city ecosystem. Dallas and Ft. Worth are 32 miles apart. Seattle and Tacoma are 34 miles about. Cleveland and Akron are 39 miles apart. Cleveland’s Cuyahoga County and Akron’s Summit County are also physically contiguous. Yet, Cleveland and Akron do not seem to share a strong sense of regional identity, but rather view themselves as independent cities and regions. The same would also be true with Akron and its smaller neighbor Canton. Youngstown is also similar, though less proximate than those other cities. All of these cities have their own officially designated metropolitan areas. This makes Northeast Ohio regions seem underpowered vs. the rest of the state. Columbus will tell you they are the biggest city (municipality) in the state. Cincinnatians will say they are the largest metro area. But clearly Northeast Ohio is the largest urban region in Ohio. If we use the largest measure of an urban trading area, the BEA Economic Area, Northeast Ohio is 4.5 million people. Columbus is at 2.8 million, and Cincinnati barely larger than its MSA population at only 2.4 million. Still, it’s fair to say that the region hasn’t figured out how to work together. In that sense, the division into separate urban identities and MSAs reflects an underlying reality. Regionalism is a sort of conventional wisdom best practice. So almost everyone at least gives it lip service. But what does regionalism look like in a region where cities don’t think of themselves as being part of a functional region? Previous attempts to market the area as Cleveland+ apparently didn’t go over well in other cities, though the label still seems to have some currency. You can view the web site here. The economic development marketing group calls themselves TeamNEO, which I suspect is better digested. I have always advocated that a greater sense of a shared identity and destiny is important for regions and states. However, this also has to take account of reality. These cities think of themselves as distinct places. There’s nothing wrong with that. So the challenge is to develop a regionalism concept that works with instead of against this grain. Historically there doesn’t appear to have been much of anything related to this in Northeast Ohio, so the communities there are having to figure it out today. So it’s to be expected that they will need to evolve and iterate on it vs. other places with more historic regional form. The important point is that the cultural givens of a particular place or region need to be understood and used as inputs into policy. This applies to all regions, which each have their own unique quirks. This is part of what gives them their unique charm. There can be cases where regional cultural traits need to be changed, but if you’re swimming against the tide on that you need to understand how difficult this undertaking will be. I recall when LeBron James was asked why he was leaving his “hometown” shortly after he left the Cleveland Cavaliers for the Miami Heat in 2010, he replied that Akron was his hometown and NOT Cleveland. (Of course, LeBron ended up boomeranging back to the Cavs a few years later.) So, there’s definitely some high profile precedent about the separate identities of the Northeast Ohio areas. Granted, Fort Worth residents seem to go out of their way to make it very clear that they aren’t from Dallas, so it’s not necessarily just a Northeast Ohio affliction. The lack of regional identity in Northeast Ohio may also be a reflection of the economic state of the region: does Akron really *want* to be associated with Cleveland and vice versa? For example, when looking at the Amazon finalists, I’m sure that Newark is doing everything that it can to tie itself to the larger star of New York City because Newark legitimately *wants* that association and sees its economic and cultural value. It’s the same with Northern Virginia and Montgomery County with respect to Washington, DC. In contrast, does someone pitching a business to come to Akron really point to proximity to Cleveland as a selling point or vice versa? That doesn’t appear to be the case. People from towns that are farther away from Chicago than Akron is from Cleveland will often say that they are from “Chicago” or “Chicagoland” because the city of Chicago drives a strong regional identity that, on the balance, people in that region want to associate themselves with. Even the Detroit area, which has had as many economic problems if not more than Cleveland, has a strong regional identity because its core city sets the tone for the region. Cleveland just doesn’t seem to have that same pull over Akron and the rest of Northeast Ohio. I think it’s something deeper than that… if it were true that cities didn’t want to get into relationships with someone who has nothing to offer, Cincinnati wouldn’t keep trying to get Dayton included in the Cincinnati MSA numbers. I’d argue that many people actually do see Cleveland and Akron as one contiguous region, but because of the Ohioan tendency to not venture to other parts of their own state, the physical flow of capital and ideas is stymied and the effect of any perceived region is in image only. I had hoped that perhaps greater regional cooperation would have started after Cleveland and Akron partnered for the 2014 Gay Games, but I guess if Cleveland can barely get any cooperation from its suburbs, its not going to get much cooperation from another regional anchor a county over. Cincinnati/Dayton is the inverse of Cleveland/Akron. In the former, it’s the larger metro that has the advantages to offer, but in the later it’s the smaller one. https://nextcity.org/daily/entry/akron-economy-economic-recovery-new-report. Dayton, on the other hand, has seen it’s economic foundations crumble in the last 15 years. This is why I’ve argued for the radical improvement of transportation connections in the midwest. If it was much easier to combine time in different midwestern metros from any given location, it would foster all sorts of new relationships from which would come new political and economic initiatives and businesses. Imagine if academics in Cleveland could easily and casually network with commercial chemists in Akron or hedge fund people in Chicago could do the same with plant science people in St. Louis. Getting someone to commit to spending their time in Cleveland alone is a hard sell, but if they think of themselves as moving to a larger region with various possibilities in various directions, the prospect looks more appealing. In both cases there still seems to be a sense that the smaller city doesn’t want to part with its regional identity. The particular problem with Dayton and Cincinnati is that the Miami Valley stretches all the way up to Sidney, which is both very culturally distinct from Cincinnati, but also much too far to really benefit from some sort of regionalism in Cin-Day. As a Daytonian, I’d very much welcome better transit connections and academic ties to Cincinnati and Columbus and maybe even Indianapolis, but I also still reject the idea that 30 miles of low-density sprawl in Butler County is somehow a strong enough bond to tie the region together. So I suppose my question is, and this goes for any region in the Midwest, how do you encourage regional cooperation without one region’s cultural differences getting cannibalized? Also, the hastily made tourist video is old news at this point ;). I’m sure you’ve been up there recently and obviously there are vast swaths of the city that are still a complete mess, and there’s still huge economic challenges, but I wouldn’t hesitate to recommend Cleveland to anyone as a place to live or to visit. I don’t know what “one region’s cultural differences getting cannibalized” means. Regions have formed, risen, and fallen from the beginning of colonial America. It’s just how things go. Dayton is getting pulled into metro Cincinnati surprisingly quickly now. It’s something most people I know in Dayton accept, even if they don’t celebrate it. You can’t have fundamental change and preserve complete continuity at the same time. Just like any relationship, you have to compromise by giving in sometimes and getting back at other times. Reviving Dayton, or anywhere else, economically without changing it’s social patterns and cultural is impossible. Maybe from my position on the small-city end of the stick is making it hard to see how this supposed merger is strengthening both parties. Other than subdivisions in Monroe, has there truly been an increased exchange in ideas, people, research, and economic growth between Cincinnati and Dayton? From what I’ve seen, it appears that the regions are doing their own planning and trying to find their own niche, but perhaps I’m wrong and the two are cooperating more. I’m curious on your insight. and scale of productive activities and institutions so Daytonians had to look for opportunities in Cincinnati or abandon Dayton altogether and move to Dallas. If Clevelanders could get past their superiority complex they might be able to achieve some good things if they spent more time and made more contacts in Akron. I haven’t been to Cleveland in many years. This about perceptions as much as about economic realities. Though, for what it’s worth, Cleveland’s economic numbers are far worse than Cincinnati’s, especially in the last few years. First off, new to this blog and I am enjoying the discussion here quite a bit. So I hate to jump in like this but reading through the comments I have to add some SWOHioan perspective. Matt, what is your basis for thinking Akron, Canton, or Youngstown are doing better economically than Cleveland? I’m only a casual observer of Northeastern OH but from what I can tell those four cities are all about on par economically, socially, demographically, and in regards to net migration. Each appears to currently be on a slight rise due to the Feds/Eds/Meds spending increases, along with the urban revitalization sweeping the country. And each is well capitalized to take advantage of the movement because of their built environments. What I don’t understand is how Cleveland, the 800-lb gorilla of the cities which has had many successful revitalization projects, a full light rail system which includes a great new BRT line, and 3 pro sports teams is somehow considered a “drowning city”? As for Southwestern OH, if you live here you’d know a couple things. The first is that Cincinnati only exists inside the 275 loop. Go outside of it and you may still be in the region, but good luck finding a plate of goetta, your nearest chili parlor that isn’t Gold Star or Skyline, or a well respected Catholic high school. All of the post 1970’s build that has happened between 275 and 675 really has its own suburban identity (I call it overgrown aimless sprawled small and medium sized canal and stagecoach towns, but others call it Daytonnati for short). Then Dayton is its own world… again, good luck finding a decent square cut pizza south of 675 unless the pizza chain has restaurants north of 675 too. Sure, we love our Greaters ice cream, Cincinnati Reds, and Skyline Chili in Dayton just as much as Cincinnatians love Esther Price candy and Mike-Sells Chips – the region has blended in some ways and consumer decisions have led to the best of each being kept. But if you ask your average Daytonian what goetta is, you’ll get just as black of a stare as if you ask your average Cincinnatian if they have ever seen a Dragons game. Each place still has its own identity. A lot of people function within one city alone aside from the occasional trip to the middle to go to IKEA, the outlet mall, Kings Island, whatever. As time goes on, I am hoping the density increases in the middle and unique identities are formed, just like how NYC is nothing like Connecticut which is nothing like New Jersey which is nothing like Long Island. Each is dense, connected by a lot of density to other dense places but yet they still have a unique identity. Aaron, Matt think of himself a know it all– the worst kind and devoid of credibility. Akron isn’t doing much better. https://www.bls.gov/regions/midwest/oh_akron_msa.htm#eag. Creating a new economy take many years to bear fruit. Cincinnati and dayton clearly are doing better. I’d say there’s more incentive and opportunties in SWO to build economic and political connections. Cincinnati’s exclusionary culture is legendary, almost unique in america. But it doesn’t mean people in SWO are immune to economic opportunities down the road. In my experience Cincinnatians will do business with those who aren’t a member of the Cincinnati tribe, but they make it clear that it’s just business. They will remind you regularly that you aren’t ‘one of them.’ The trust level with outsiders is low and its’ up to outsiders to ‘sell’ whatever they have to Cincinnatians, but there seems to be economic possibilities there that aren’t in Northeast Ohio. For reference, the Cleveland CSA does include the “satellite metros” of Akron, Canton/Massilon, Ashtabula, New Philadelphia/Dover, Norwalk, and Sandusky, but not Youngstown/Warren/Boardman. It is, by a healthy margin, the largest CSA in the state, and third in the “lower Midwest” behind Chicago and Detroit. However, the CSA includes everything from urban brownfields to Amish farms in Ohio’s slice of Appalachia. It’s hard to come up with a coherent identity. It’s really a microcosm of Ohio’s identity issue in general. When you’re a crossroads of relatively equally-balanced and competing cultural interests, it’s hard for a single sense of “self” to shine through. That’s the thing I don’t get, though. Ohio’s residents are mostly urban or suburban. I think what happens is that with all of these metros being relatively balanced population-wise, they find themselves competing for the same resources and the same people. The cultural differences really are at the “urban” or MSA level; I don’t think it’s much an urban/rural divide as people not from Ohio perceive it to be. when i was younger i always though akron was a garbage city. as i grew up and travel more i realized cleveland was also a garbage city. I lived in Cleveland for a short time, writing for Crain’s,and we would include Akron in our coverage — but not much. I wonder if the separation has to do with their industrial legacies. Cleveland was steel and heavy manufacturing, Akron was rubber, and each had their own industrial identities. Funny thing, though. Most of us in the Akron area root for the Browns, Indians, and Cavs. This was true long before LeBron. And yes, I know there is a large and visible Steelers contingent as well, but by and large, the sports loyalties in Akron are with the Cleveland teams. How much is race a factor here? Is it a question of smaller, white-flight cities not wanting to be a part of Cleveland? The second question is how long each of these places has been declining economically. Have they all been chasing and fighting for the same deals? Zero-sum think often leads to competition rather than cooperation. Akron isn’t a 1950s era suburb that Cleveland whites fled *to*; it was home to nearly 300,000 people who fled to their own Akron suburbs just like Clevelanders went out to into new Cleveland suburbs. As for your second question – Cleveland’s population peaked in 1950 and the economic decline picked up speed by the late 1960s. Akron peaked a little later, around 1960, and it hasn’t declined nearly as much as Cleveland did, but its population losses are more tied to the moving of many of the rubber companies out of the area. I still think it comes down to Midwestern provincialism more than anything… as mentioned above, many Akronites share interest with Cleveland sports team and unlike Dayton, Akron doesn’t have their own news anchors and only gets Cleveland broadcasts. But economically, people just don’t venture around much, even within their own metro. Agreed. Akron definitely isn’t just another Cleveland suburb in the same sense that Parma, Westlake, or Beachwood are unmistakably Cleveland suburbs. Akron is arguably more of a “captured satellite,” to use Pete Saunders’ terminology. 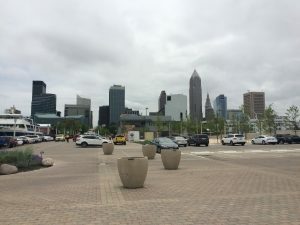 It has recently (15-20 years) become more integrated into Cleveland’s economy in a regional sense, but in most other respects, it’s still its own city, with its own history, culture, and suburbs even (e.g. Cuyahoga Falls, Kent, Barberton, Wadsworth, etc.). I think the lack of regional cohesiveness in NE Ohio mostly stems from the fact that despite the proximity of its urban centers, they don’t really share deep social, political and economic ties. Or at least, these ties to the extent that they exist haven’t been nurtured and strengthened to the point where the region would consciously acknowledge its cohesive identity as is the case in places like the Twin Cities, Chicago, NYC, etc. Having grown up in Akron, I can tell you that it was and remains very much a city in its own right, with its own unique culture, politics, history, institutions and traditions that very much stand apart from Cleveland’s. A large part of this is simply due to how the cities developed. As rkcookjr mentioned, Cleveland reached its zenith as a steel and auto manufacturing town, while Akron developed around its rubber industry. Accordingly, there wasn’t much contact or overlap between the cities’ executive, professional, and labor union circles (The steel and rubber workers’ unions have only recently merged, back in the 90s). Also, there wasn’t traditionally a lot of social and economic overlap throughout the region because most people lived very close to where they worked. The overlap that exists now is actually a much more recent phenomenon, and has only really taken off in the past 25-30 years with the explosion of suburban sprawl and inter-city commuting. Also, as others have pointed out, NE Ohio’s lack of a inter-city mass transit network has to be considered as a factor in its cohesiveness or lack thereof as well. There is something to be said for a regional transit system and its ability to foster common connections and a shared identity amongst the population it serves. I will say, for what its worth, that most Akronites have always sort of looked at Cleveland as the “big city” where you went for big-ticket events, like concerts, festivals, car shows, Browns/Indians/Cavs games, etc. Cleveland’s broadcast media sector also covered the entire region, so there was this sense of Cleveland being the region’s hub where the real action took place. Cleveland’s media influence and its professional teams have certainly fostered a sort of superficial regional identity with Cleveland at its heart for better or for worse. In contrast, Akron’s broadcast media sector was much smaller and with much less regional infiltration. Akron today doesn’t even have its own local TV news broadcast. Truly though, much more than Akron and Cleveland, I always thought that Akron and Canton should be much more closely aligned on multiple fronts than they are because they are even more similar–and closer–to each other than Akron is to Cleveland, and genuinely could be twin cities. But again, Canton had its own unique history and culture that didn’t overlap much at all with Akron’s. Plus there is this almost palpable fear among Canton’s leaders that Akron wants to gobble them up. For its part, however, Akron’s leadership doesn’t seem to even give much thought to Canton beyond the presence of the Pro Football Hall of Fame. As for Youngstown, its really out on the edge of the region, and in some respects it might be more inclined to see itself as part of Greater Pittsburgh/Western PA except for the fact that it is in Ohio. Lots of disparate thoughts on this topic, and I’ll try to take them all one by one. Regarding Cleveland and Akron, I think the elements are there for an actual joining of the metros, but metro area size, and geography, have prevented it thus far. If metro Cleveland were a larger metro, say 4-5 million instead of 2 million, with edges pushing out even closer to Akron, you’d see greater connection between the two. Sometimes metro area cooperation and consolidation is a result of force, not good feelings. I’m reminded of Joliet, Aurora, Elgin and Waukegan outside of Chicago, all about 40 miles from the Loop. Each were every bit as independent from Chicago as Akron still is from Cleveland. But the sheer size of Chicagoland overtook them (the captured satellites I’ve mentioned before). And I’d like to hear from Northeast Ohio folks, because I wonder if the 32,500-acre Cuyahoga Valley National Park acts as a geographic barrier to metro connection there. The Cuyahoga Valley National Park certainly doesn’t help close the gap between Cleveland and Akron. It’s obviously land that will never be developed, so there won’t be much regional connectivity that emerges there beyond what it already contributes to as a commonly-shared resource. At the same time, I honestly think if NE Ohio were thriving economically and also substantially gaining population, instead of struggling economically and barely holding steady with people spreading out across the region from its urban cores, we’d see more of an emerging sense of a strong regional identity. Some of the notorious parochialism between the major cities and also between their suburbs would indeed be overwhelmed by social and economic pressures to accommodate such growth, instead of holding up as if everything naturally begins and ends at the municipal line. I also think the Turnpike actually plays a major role in diminishing a strong connection between the two cities. It’s not *that* expensive to go from the southwest and far-western portions of the Cleveland metro via Turnpike to Akron, but it’s enough of a disincentive/hassle that it probably pushes more people in Lorain and Medina counties toward just going up to Cleveland. It’s a little bit different along Route 8/I-480/I-271 on the southeast corner around Streetsboro, Kent, and Twinsburg, though. Kent in particular seems to have a dual identity as both a Cleveland an an Akron suburb, based on its pull from the university. Akron/Cleveland is probably a little bit more like Detroit/Pontiac in some respects than a Dallas/Fort Worth, especially when the Richfield Coliseum was still active. The early 70s was definitely the closest the metros came to merging, between the Coliseum, Blossom Music Center, and maybe even the Randall Park Mall being built in that region between the cities. But the National Park cut off the continuation of that sprawl, and so Cleveland started to sprawl along I-90 and I-71 instead of I-77 and OH-8. 1. There is little tradition of public / civic identity in general, so the absence of a regional identity is unsurprising. 2. For instance, consider lakefront property: most of the Lake Erie coastline is privately owned. There are a few beaches, to be sure, but mostly it’s a private affair. The vast resource of Lake Erie is perceived–and treated–as a private resource. 3. There are lots of private schools, and as such less investment in public schools. (To be fair, Shaker Public is very well-regarded, and I’m sure there are others). Nevertheless, the focus on private schools over public schools is more evidence of a private, consumer-class identity rather than a public, civic identity. 4. Drive-till-you-qualify suburbs: With little geographic restriction, Cleveland regional sprawl is largely unchecked. As a result, people continue to live–and move–as far from the regional center as possible. A spread out population diminishes chances for cohesive regional identity. Sprawl hasn’t diminished the regional identity of NYC, Boston, Philly, DC, LA, Chicago, KC, MSP, or any other large metro, except maybe Detroit as mentioned above. Why Cleveland? I’ve found the private school thing to be much more strongly felt on the east side than the west side of Cleveland. Sure there’s St. Ed’s and St. Joe’s and Magnificat on the west side (Ignatius seems to draw more equally), but they can’t match the sheer number of private schools, Catholic or otherwise, across the eastern suburbs. I think something else that’s interesting is that Cleveland does have an exceptionally large donor class for a region of its size, but their efforts of supporting institutions such as the art museum and the Cleveland Orchestra and the theatrical arts don’t seem to translate into any sort of cohesive civic pride/identity. I’m not sure if it’s a result of these donors frequently being wealthy businessmen sitting out on their Hunting Valley estates donating money to Cleveland as more of a feel-good effort or a tax writeoff and thus not truly contributing to a civic identity beyond a monetary one, or if it’s something more complex. These comments often puzzle me. You’re proposing items that differentiate NEO from other regions, but what is your perfectly normal, average counterfactual metro? Every metro in the country has private schools. Does a higher share of students attend privates in NEO? Can you name any place other than small-town Texas that bases civic identity on public schools? Every metro in the country has a donor class, arts institutions, and some civic pride in those institutions. Outside NYC and consolidated counties, >90% of those donors live in exclusive suburbs, not the central city. Regarding the lakefront, there is a lot of public lakefront. It is well used but not overly so. If there were an extra ten miles of public waterfront, the users would be more disbursed, and people would complain about lack of vitality. Where is the waterfront more central to civic identity? Philly? DC? Buffalo? St. Louis? Austin? Pheonix? Baltimore inner harbor? LA and San Diego, obviously. Would more lakefront tie Akron and Cleveland closer? As Chris noted, there is sprawl everywhere. Maybe I don’t get the premise of this discussion. Why doesn’t Akron see itself as part of Cleveland-land like Joliet is Chicagoland? Akron is a nice small city facing the standard Rust Belt challenges. Its got plenty of things to do, and when you have the time, you can run up to Cleveland for a bigger name concert or a top-level traveling exhibit at the art museum. Why doesn’t Cleveland think of itself as part of a larger region? I’m not sure that it doesn’t. How should this be expressed that isn’t happening? 15 years in Cleveland, I went to Akron twice. Its a perfectly nice place, but the things to do in Cleveland can more than exhaust your time and money, so the draw needs to be exceptional. Four years in NYC, I went to NJ twice. I never went to Joliet or Naperville from Chicago. Anything that happens in Cleveland, there is the an expectation people from Akron will be involved. Hiring 100 employees? Some will be driving up from Akron. Opening a destination restaurant? Some customers will be from Akron. Building an arts venue? Some patrons will be from Akron. How is this different from anywhere else? Moses good points. I have lived in NYC, Cincy, Tampa, and for the most part if people had their druthers, most would choose private schools if they can afford it. I too am puzzled as to what public schools have to do with anything and in particular Cleveland/Akron and its identity.